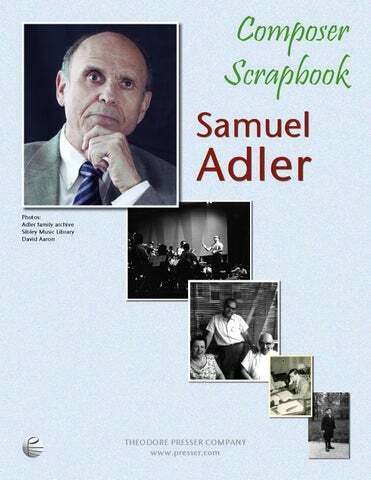 Samuel Adler was born March 4, 1928, Mannheim, Germany and came to the United States in 1939. He was inducted into the American Academy of Arts and Letters in May 2001, awarded the the highest civilian honor from the German government (the Bundesverdienstkreuz, 1st class) in 2018, and inducted into the American Classical Music Hall of Fame in October 2008. He is the composer of over 400 published works, including 5 operas, 6 symphonies, 12 concerti, 8 string quartets, 4 oratorios and many other orchestral, band, chamber and choral works and songs, which have been performed all over the world. He is the author of three books, Choral Conducting (Holt Reinhart and Winston 1971, second edition Schirmer Books 1985), Sight Singing (W.W. Norton 1979, 1997), and The Study of Orchestration (W.W. Norton 1982, 1989, 2001). He has also contributed numerous articles to major magazines and books published in the U.S. and abroad. Adler was educated at Boston University and Harvard University, and holds honorary doctorates from Southern Methodist University, Wake Forest University, St. Mary’s Notre-Dame, the St. Louis Conservatory, and Hebrew Union College – Jewish Institute of Religion. His major teachers were: in composition, Herbert Fromm, Walter Piston, Randall Thompson, Paul Hindemith and Aaron Copland; in conducting, Serge Koussevitzky. He is Professor-emeritus at the Eastman School of Music where he taught from 1966 to 1995 and served as chair of the composition department from 1974 until his retirement. Before going to Eastman, Adler served as professor of composition at the University of North Texas (1957-1977), Music Director at Temple Emanu-El in Dallas, Texas (1953-1966), and instructor of Fine Arts at the Hockaday School in Dallas, Texas (1955-1966). 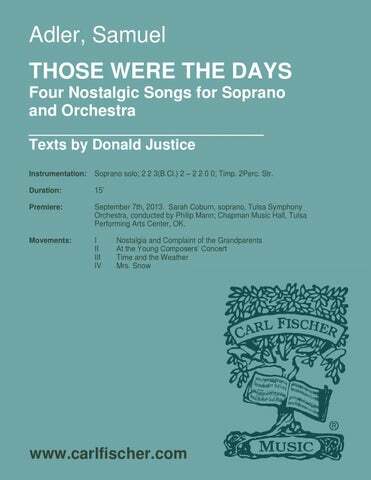 From 1954 to 1958 he was music director of the Dallas Lyric Theater and the Dallas Chorale. From 1997 to his retirement in 2014 he was a member of the composition faculty at the Juilliard School of Music in New York City, and was awarded the 2009-10 William Schuman Scholars Chair. Adler has given master classes and workshops at over 300 universities worldwide, and in the summers has taught at major music festivals such as Tanglewood, Aspen, Brevard, Bowdoin, as well as others in France, Germany, Israel, Spain, Austria, Poland, South America and Korea. Adler has been awarded many prizes including a 1990 award from the American Academy of Arts and Letters, the Charles Ives Award, the Lillian Fairchild Award, the MTNA Award for Composer of the Year (1988-1989), and a Special Citation by the American Foundation of Music Clubs (2001). In 1983 he won the Deems Taylor Award for his book, The Study of Orchestration. In 1988-1989 he was designated “Phi Beta Kappa Scholar” In 1989 he received the Eastman School’s Eisenhard Award for Distinguished Teaching. In 1991 he was honored being named the Composer of the Year by the American Guild of Organists. Adler was awarded a Guggenheim Fellowship (1975-1976); he has been a MacDowell Fellow for five years and; during his second trip to Chile, he was elected to the Chilean Academy of Fine Arts (1993) “for his outstanding contribution to the world of music as a composer” In 1999, he was elected to the Akademie der Kuenste in Germany for distinguished service to music. While serving in the United States Army (1950-1952), Adler founded and conducted the Seventh Army Symphony Orchestra and, because of the Orchestra’s great psychological and musical impact on European culture, was awarded a special Army citation for distinguished service. In May, 2003, he was presented with the Aaron Copland Award by ASCAP, for Lifetime Achievement in Music (Composition and Teaching). from “The Musical Offering”(arr.) 8:00 Fl. Cl. Tpt. ; Hp. Str. 8:00 4Tpt. 1Hn. 4Tbn. Tu. 2Perc. 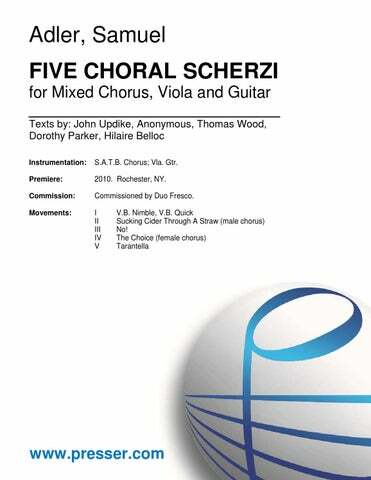 For Mixed Chorus, Viola and Guitar S.A.T.B. Chorus; Vla. Guit. The Man Without Tolerance. 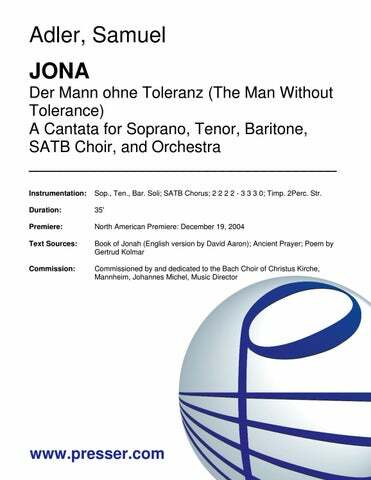 A Cantata for Soprano, Tenor, Baritone Soli, Choir and Orchestra 35:00 Sop., Ten., Bar. 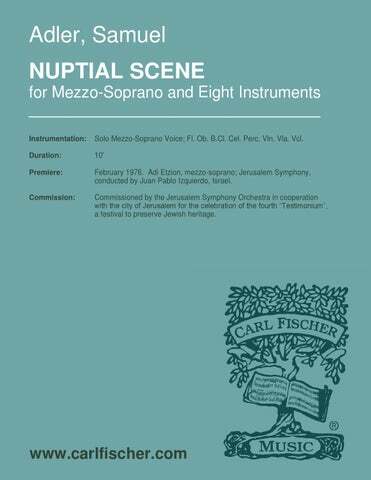 Soli; SATB Chorus; 2 2 2 2 – 3 3 3 0; Timp. 2Perc. Str. 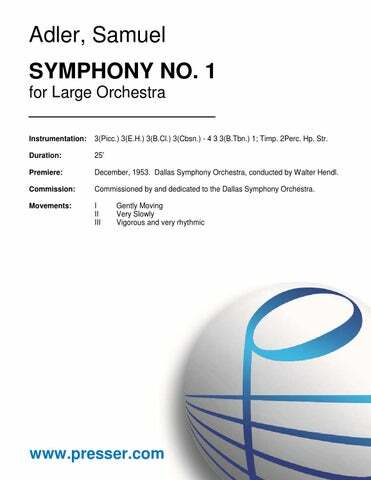 An Overture for Orchestra 9:00 2(dbl. Picc.) 2 2 2 – 2 2 2 0; Timp. 2Perc. Str. 15:00 3(dbl. Picc.) 3(E.H.) 3(B.Cl.) 2 – 4 3 3 1; Timp. 2Perc. Hp. Str. 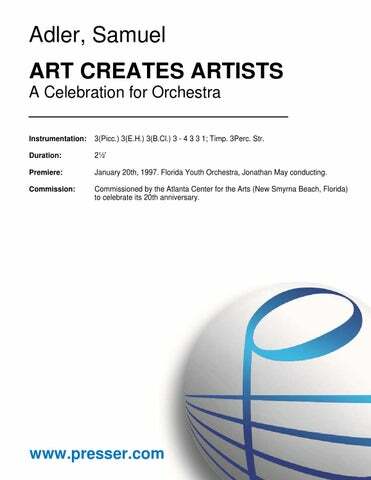 A Celebration for Orchestra 2:30 3(Picc.) 3(E.H.) 3(B.Cl.) 3 – 4 3 3 1; Timp. 3Perc. Str. 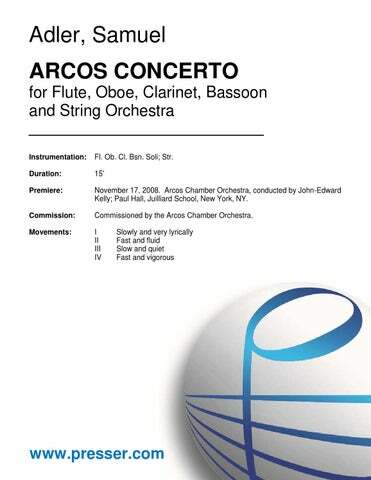 A Suite for Orchestra 18:00 3(Picc.) 3(E.H.) 3(B.Cl.) 2 – 4 3 3(B.Tbn.) 1; Timp. 3Perc. Str. 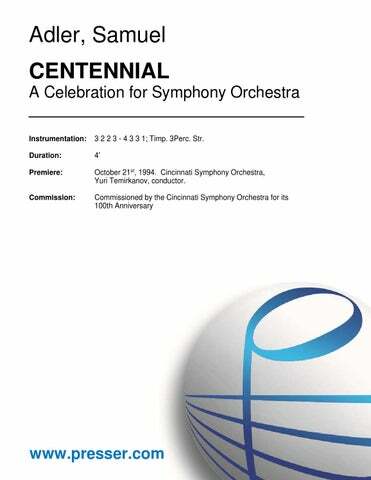 A Celebration for Symphony Orchestra 4:00 3 2 2 3 – 4 3 3 1; Timp. 3Perc. Str. 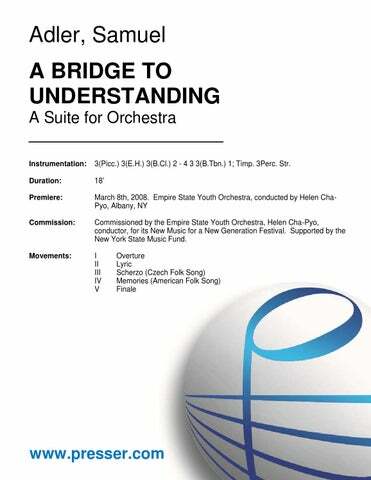 A Poem for Orchestra 8:00 3(Picc.) 2 2 2 – 4 3 3 1; Timp. 2Perc. Str. for String Orchestra 6:00 Str. Overture for Symphony Orchestra 8:00 3(Picc.) 3(E.H.) 3 3(Cbsn.) – 4 3 3 1; Timp. 3Perc. Pno.(Cel.) Str. 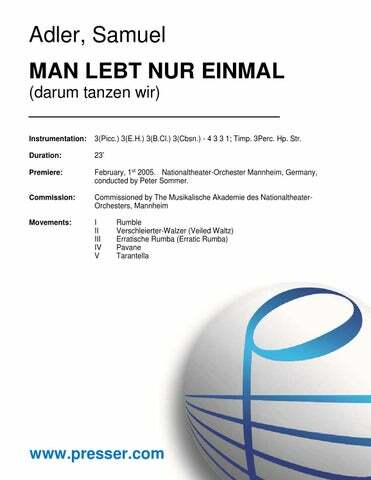 Dance Suite for Large Orchestra 23:00 3(Picc.) 3(E.H.) 3(B.Cl.) 3(Cbsn.) – 4 3 3 1; Timp. 3Perc. Hp. Str. 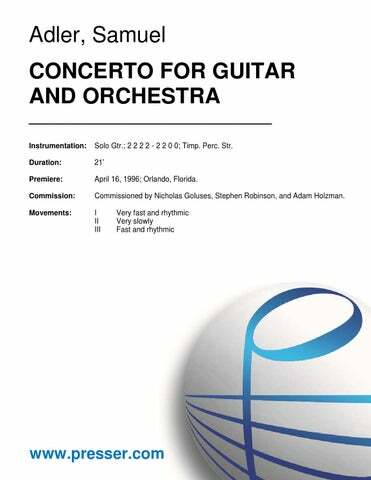 17:00 SATB chorus; picc., fl. (2), ob. (2), eng.hn., Eb cl., cl. (3), a.cl., b.cl., bsn., a.sax. (2), t.sax. ; hn. (4), tpt. (4), tbn. (3), bar.hn., tba. ; timp., perc. (4), hp. 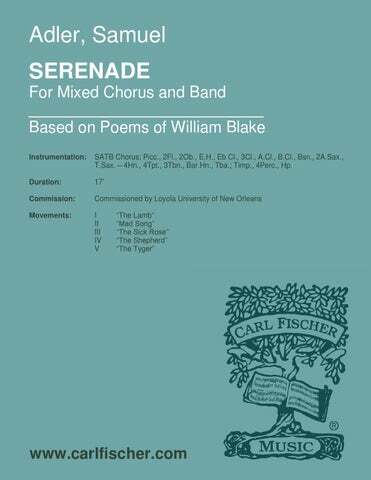 for Orchestra(arr.) 10:00 2 2 2 2 – 2 2 0 0; Timp. Str. Suite of Dances for Orchestra 20:00 3(Picc.) 3 3(B.Cl.) 3(Cbsn.) – 4 3 3 1; Timp. 3Perc. Pno. Str. 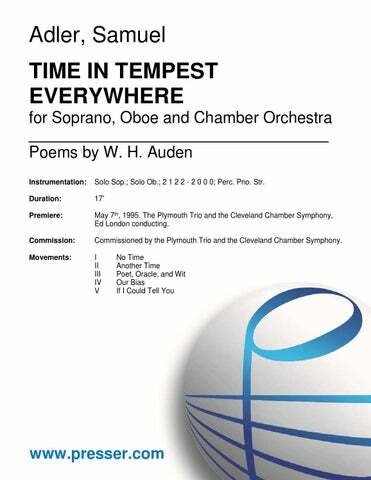 A Poem for Orchestra (“September 1, 1939” by W. H. Auden) 5:00 Small Orch. : 2(dbl.Picc.) 2 2 2 – 2 2 0 0; Timp. Perc. Str. Full Orch. : 2(dbl.Picc.) 2 2 2 – 2 2 2 0; Timp. Perc. Str. 27:00 3 3 2 3 – 4 3 3 1; Timp. Hp. Str. 29:00 3 3 3 3 – 4 3 3 1; Timp. Perc. Pno. Str. 20:00 3 3 3 3 – 4 3 3 1; Timp. Perc. Pno. Str. 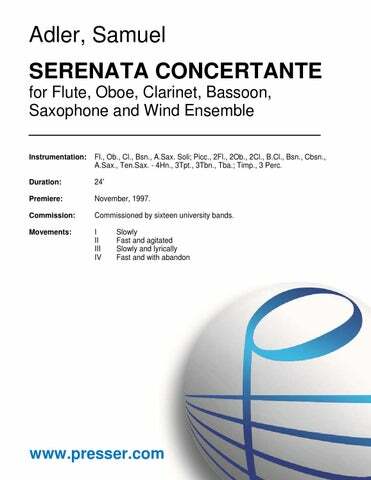 for Soprano, Oboe and Chamber Orchestra 17:00 2 1 2 2 – 2 0 0 0; Perc. Pno. Str. 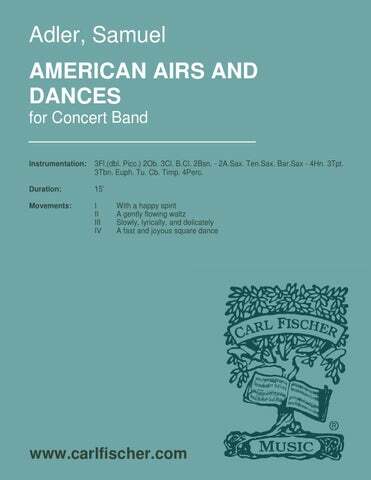 18:00 Solo SATB voices; SATB Chorus; Fl., Cl., Bsn., A.Sax. ; Vln., Vcl. ; amp. Hpschd., Perc. 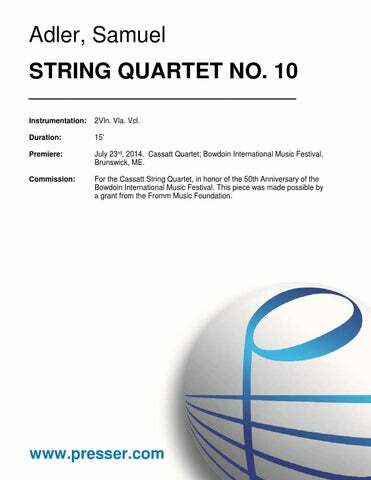 for Flute, Oboe, Clarinet, Bassoon and String Orchestra 15:00 Fl. Ob. Cl. Bsn. Soli; Str. A Portrait of a Klezmer for Clarinet and String Orchestra 14:00 Solo Cl. ; Str. 18:00 Solo Woodwind Quintet; 0 0 0 0 – 4 3 3 1; Timp. Perc. Str. 20:00 Solo Vcl. ; 3(Picc.) 3(E.H.) 3(B.Cl.) 3(Cbsn.) – 4 3 3(B.Tbn.) 1; Timp. 3Perc. Pno. Cel. Str. 21:00 Solo Gtr. ; 2 2 2 2 – 2 2 0 0; Timp. Perc. Str. 20:00 Solo Hn. ; 2 2 2 2 – 2 2 0 0; Timp. Perc. Str. 20:00 Solo Org. ; 3(Picc.) 3(E.H.) 3(B.Cl.) 3(Cbsn.) – 4 3 3 1; Timp. Perc. Hp. Str. 21:00 Solo Tu. ; 3(Picc.) 3(E.H.) 2 2 – 4 3 3(B.Tbn.) 0; Timp. 2Perc. Str. 20:00 Solo Vla. ; 3(Picc.) 3(E.H.) 3(B.Cl.) 2 – 4 3 3(B.Tbn.) 1; Timp. 2Perc. Str. 20:00 Solo Vn. ; 3(Picc.) 2 3(B.Cl.) 2 – 4 3 3(B.Tbn.) 0; Timp. 3Perc. Str. for Violin and Orchestra(arr.) Solo Vln. ; 3(Picc.) 3(E.H.) 3(B.Cl.) 2 – 4 3 3(B.Tbn.) 1; Timp. 2Perc. Str. A Poem for Organ and Orchestra 14:00 Solo Org. ; 3(Picc.) 3(E.H.) 3(B.Cl.) 3(Cbsn.) – 4 3 3(B.Tbn.) 1; Timp. 3Perc. Str. 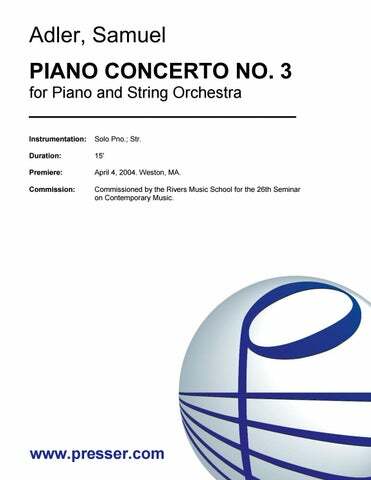 for Piano and String Orchestra 15:00 Solo Pno. ; Str. 22:00 Solo Pno. ; 2 2 2 2 – 2 2 2 1; Timp. 2Perc. Pno. Str. Four Nostalgic Songs Solo Voice; 2 2 3(B.Cl.) 2 – 2 2 0 0; Timp. 2Perc. Str. 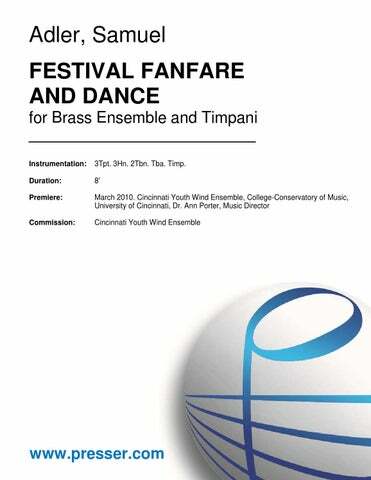 Version for Band 15:00 3Fl.(dbl. Picc.) 2Ob. 3Cl. B.Cl. 2Bsn. 2A.Sax. Ten.Sax. Bar.Sax – 4Hn. 3Tpt. 3Tbn. Euph. Tu. Cb. Timp. 4Perc. 21:00 Solo Guit. ; 3(Picc.) 3(E.H.) 3(B.Cl.) 3(Cbsn. ), 2AltoSax, Ten.Sax. – 2 3 2 1; Timp. 2Perc. Cb. A Folksong Suite for Chorus and Wind Ensemble 18:00 SATB Chorus; 3(Picc.) 3(E.H.) 5(Eb Cl./B.Cl.) 0, AltoSax. – 2 2 2 1, Euph. ; Timp. Perc. for Flute, Oboe, Clarinet, Bassoon, Alto Saxophone and Wind Ensemble 24:00 Fl., Ob., Cl., Bsn., A.Sax. Soli; 3(Picc.) 2 3(BbCl.) 2, A.Sax., Ten.Sax. – 4 3 3 1; Timp. 3 Perc. A Musical Drama for Baritone Solo, Dancers and Orchestra 30:00 Solo baritone voice; dancers; 2(dbl. Picc.) 1 1 1 – 1 1 2 0; Perc. amp.Hpschd. Str. 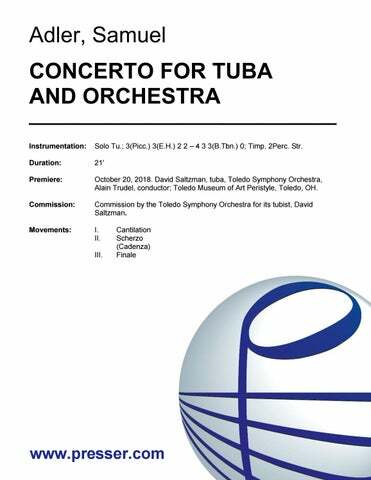 40:00 SATB chorus; Children’s Chorus; 3(Picc.) 2 3(B.Cl.) 2 – 4 3 3 1; Timp. 3Perc. Pno. Str. Adler consistently finds new things to say within his chosen musical language and makes wonderfully resourceful use of his tiny forces. This piece is a winner in every way. …mysterious chants, quizzical chattering, jazzy riffs and virtuosic flights came together to form a substantial and vigorous whole. …opens on a note of tranquil reflection. It continues to unfold in a gracefully spacious manner, ratcheting up tension in small stages and often using the solo instrument to add a layer of calm introspection to proceedings. 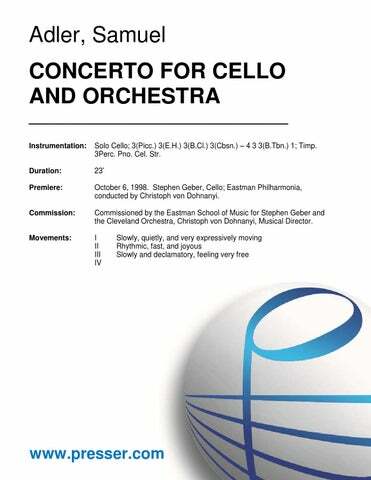 …textural and tuneful elements successfully rub shoulders…the range of contrast is wider [than other viola concertos], the orchestration more colorful (listen to the inventive writing for solo accompanied by temple blocks in the finale). I would say that it represents a major contribution to the genre. Mr. Adler wrote a lovely orchestra part for this Concerto, and it fits with the viola nicely. They were balanced well, sometimes complimenting, sometimes contrasting each other, but always making musical sense. 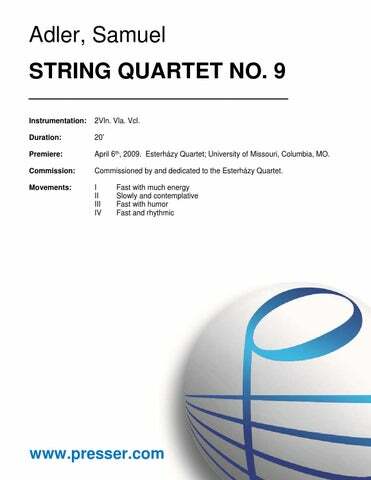 This was a truly delightful piece … I certainly hope that this piece makes its way into the standard viola repertoire soon. The Concerto reflects Adler’s love of the viola, which was his own instrument, as well as his quick-witted, and it must be said, quirky mind. It pushes the viola to its limits. This music is genuinely memorable. This exhilarating three-movement work walks a fine line between accessibility and substance. 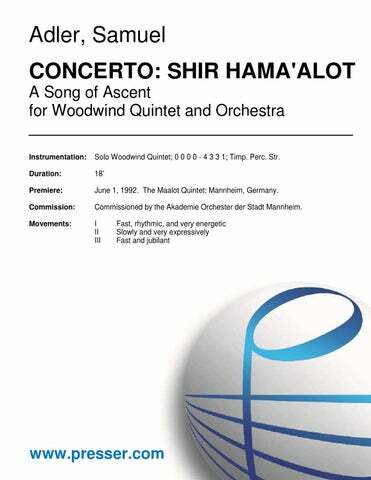 The orchestration is especially skillful and wonderfully diaphanous at times. 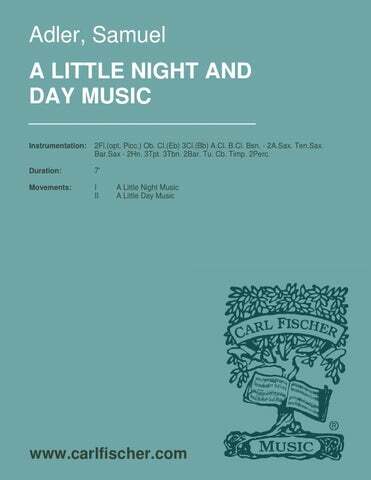 The work came across like a cheerful, untroubled piece which is essentially what the composer was shooting for in varying degrees. These works are benchmarks of contemporary American composition: monumental in scale and embracing a wide expressive spectrum with ease and visceral power, Adler merges twenty-first century ebullience with an almost classical economy and balance. Adler exploits all the resources of the organ. 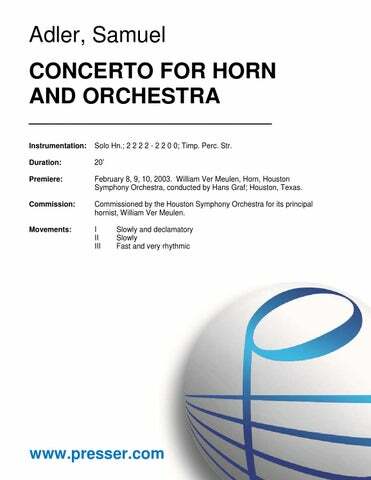 It is a bright, outgoing piece in which the organ becomes the assertive partner of the large orchestra. 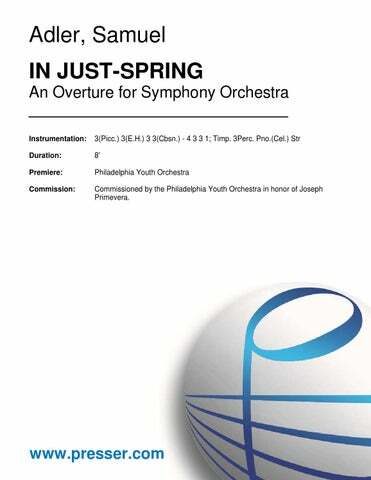 It was a breath of fresh air in this season and its attractive melodies in a basically theatrical setting made this piece a most celebratory and thrilling work. …a skillfully put-together and most effective work. 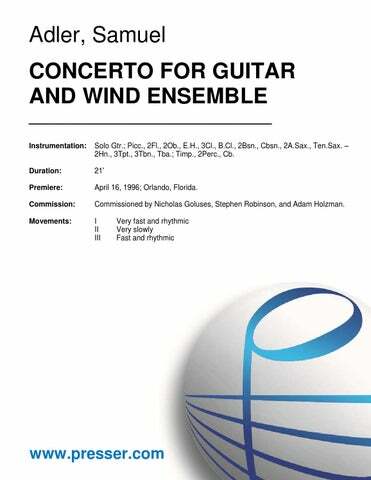 Adler’s “”Sonata”” is a work that is both streamlined and confidently written, a splendid contemporary guitar piece. It recalls Britten’s Nocturnal without the color. 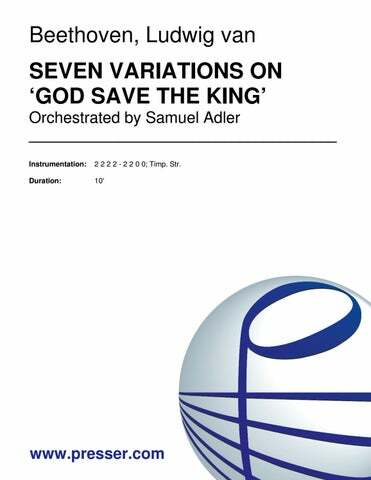 …a splendid orchestral tour de force which showcases every section of a very fine orchestra indeed in a vivid recording. Don’t play this if you have a hangover. The American composer Samuel Adler’s sixth symphony is so loud, frantic and brilliantly exciting it will blow you across the room. In three movements it crackles with electric energy, with only the central section offering a brief respite. Yet for all the clamour it is tightly organised, with a clarity of purpose and sense of direction that sends it hurtling to a dramatic conclusion. Everything sounds organically grown with an impeccable ear for detail and color. Adler makes explosive use of the chamber orchestra, but evokes tenderness and delicacy as the texts raise more questions than answers. A fascinating and haunting work.